For Rfactor league number 48 we will going back to the class of racing that has brought KSR some of its largest grids and some of its toughest racing. 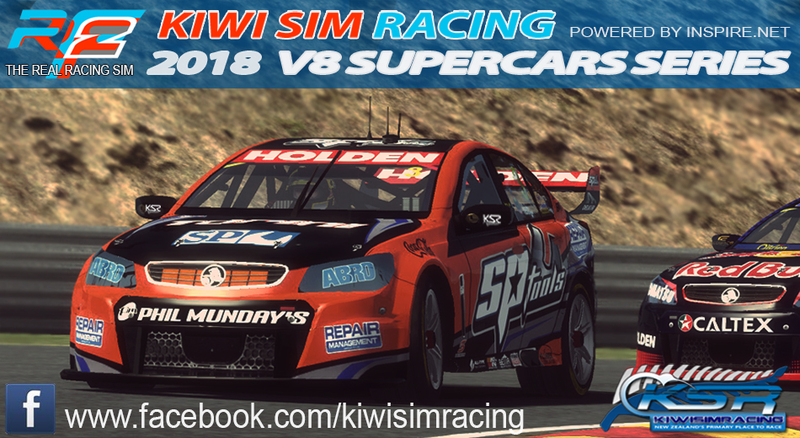 Its Big, Its Loud, Its Fast and has V8 in the front of it, we are talking of course about the V8 Supercars! We will be taking these beasts to some of Australia's best tracks... From the streets of Adelaide to the tyre killer in WA, From the sunset in Sydney to the top of the Mountain. There will be something to challenge even the most experienced Sim racer. Copy these files to your rFactor2 Packages folder, and install all the v6.6 cars first, and then all the v6.93 updates. When selecting a car in offline mode, please make sure you select a vehicle labelled as v6.93 and not v6.6, as the handling characteristics are completely different. Please note: if you have the FVR Supercars mod installed via Steam Workshop you must unsubscribe to it first before installing these packages. Then reinstall the 6.6 and 6.93 packages. [21/08] - Official Practice Night (Adelaide, Queensland raceway and Sydney Motorsport Park) Highly recommended for people to show up for this, Its the perfect Time to test a couple of things and make sure the mod as well as the tracks are installed correctly. 1: Download file, and save to your rFactor 2 Packages folder - this can be found by right clicking rFactor 2 in Steam, going to properties, local files, browse local files. For each round we will be running 2 races per night, First race will be 50km race that will not require a pit stop. The second race of the night will be a 100km race which will feature compulsory pit stop for 4x Tyres. However Round 6 at Sydney Motorsport Park will feature a Single 150km race with 2 CPS and Round 7 at Bathurst will be a single 200km race with 3 CPS. Both of these races will be double points. Round 6 at Sydney Motorsport Park will also have a slightly different start time. This will start in the daylight and slowly move to sunset. For race 1 of each night the grid will be set by a 15 min open Qualifying session for each round at 8.40pm, This will be an open Qualifying session with unlimited laps and everyone on track at the same time. Race 2 will be set with a reverse top 6. For round 6 and 7 there will be no race 2. When crossing the finish line, crashing your car is not acceptable, nor is any Voice Comms chat untill the last person has finished. Driver's are still racing, and racing for position, and it is unfair to disrupt their racing. Pull over off the track and Esc.. or drive back to the pits. For this season there will be no restarts at all for anything that happens on track. If there is a turn 1 crash it will just be a racing deal. We will however do a restarts if we have issues with people joining the grid or if someone drops from the server in the first lap of the race. All races have a 50% DNF threshold - no points if you don't get to that race percentage. Both races have cross the finish line bonuses, so get that car repaired and finish the race. As this league is spread over a eight, we are allowing each driver to have one drop-round during the season. After the final nights racing anyone who has completed all eight rounds of the season will have their worse result dropped from the points site in the form of a points penalty. This way more drivers will be able to fight for the league title despite real-life commitments. Since custom skins overwrite the standard ones, those using custom skins should reserve the standard skin they are overwriting? Or will the standard skin still be able to be used alongside the custom skin? Not sure, but I'd assume a default car will need to be reserved. I'd hit up whoever pushed for custom skins, they should know. Doesn't get my vote. Separately, unless someone has custom skins turned off and they'll see the standard skin. Points site is ready for registrations. Cheers to Murphy for organizing, all the people that helped test the things and as always, massive shout out to Riven and Inspire for hosting. Thanks Murphy for organizing the series, and to Matt for his admin help. Also thanks as usual to Riven and Inspire for making this possible with hosting etc. And lastly, thanks to all who turned up and helped make it a fun series.